His real name was Julius Prott. First he studied at the Stern'sche Konservatorium in Berlin, then he continued his education under Pietro Romani in Florence. Additionally he trained with Francesco Lamperti in Milan, Corsi and Deck-Servani and Gustave Roger in Paris. In 1863 he made his debut at the Opera House in Wroclaw. He made successful guest appearances in Germany, Italy, also in London, Madrid, Moscow and Constantinople. In 1870 at the Drury Lane Theatre in London he sang the part of Erik in the English première of R. Wagner’s ‘’Fliegender Holländer’’. In 1872 he appeared at La Scala as Max in ‘’Freischütz’’. Several times he visited North America, where he sang at the operatic stages in Boston, Chicago, New York and in many other towns. In the 1888-1890 and from 1899 to 1900 seasons he was engaged by the New York Metropolitan Opera. In South America he was to be heard among other things in Buenos Aires and Montevideo. In the 1866-1868 seasons he was a member of the Hofoper in Wien. 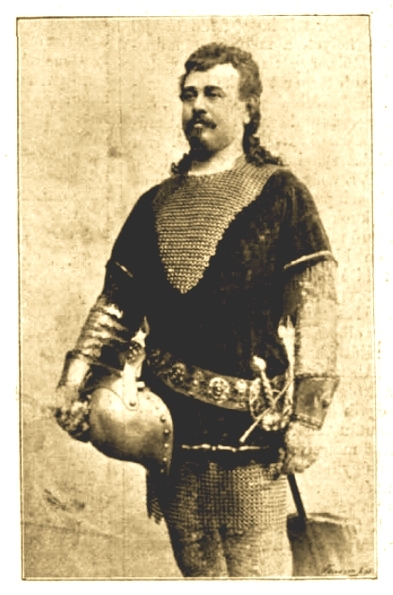 In the 1878-1888 and again from 1892 to 1900 seasons he belonged to the ensemble of the State Opera House in Budapest, where he and retired from the stage. His best roles were Raoul in ‘’Huguenots’’, Johann von Leiden in ‘’Le prophète’’, Arnoldo in ‘’Guglielmo Tell’’, Eleazar in ‘’La Juive’’, Faust, Manrico in ‘’Trovatore’’, Otello and also Wagner repertoire (Lohengrin, Tannhäuser, Rienzi, Siegfried). Since 1879 he owned in Trieste a market garden, which was internationally known for his rose cultures. He made a few recordings for Bettini cylinders.